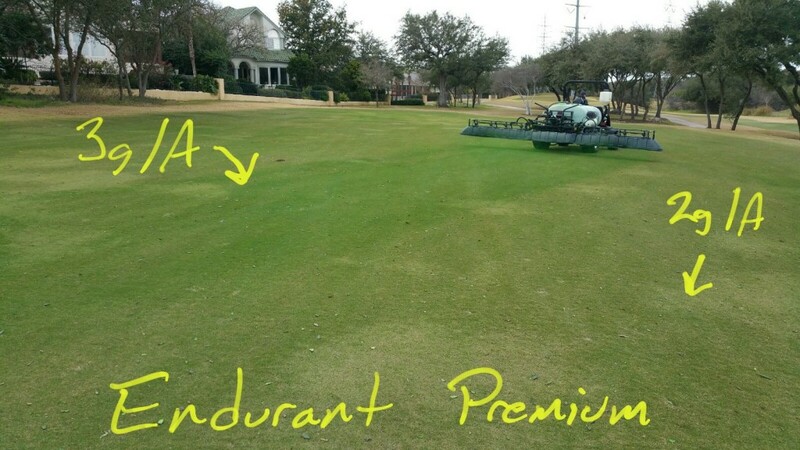 Check out the effects of various application rates when using Endurant Premium turf colorant. 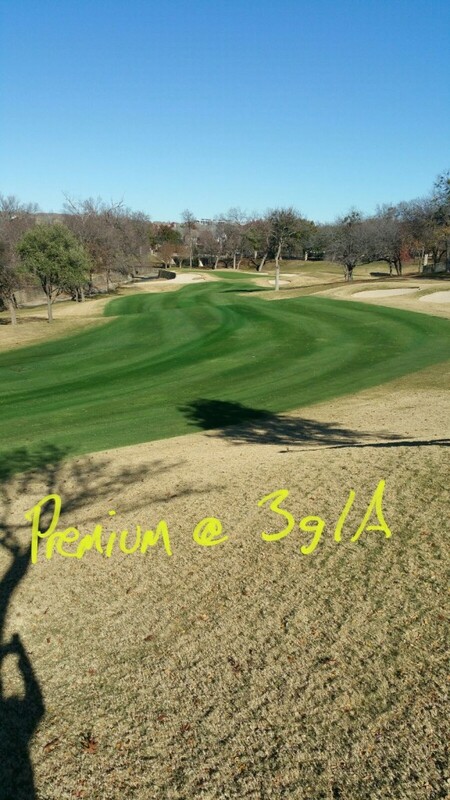 Photos of various Endurant Premium application rates help golf course superintendents to select the optimal colorant and rate for the desired look to fit their property, members and guests. Endurant turf colorants have been used by golf course superintendents for years, but are also popular with landscape professionals, homeowners, sport field managers, home owners’ associations, sod growers, municipalities and many other users. Endurant Premium is the ultra concentrated organic pigment in the Endurant line of colorant that is blended with binders for optimal coverage and lasting durability. Of the colorants in the Endurant line, Endurant Premium is rich, deep green. Other colorants in the line include Endurant FW for fairways, Endurant PR for a perennial rye look, Endurant TE turf enhancer for actively growing grass and Endurant TC, the original colorant. Learn more about the full line at www.TurfPaint.net. 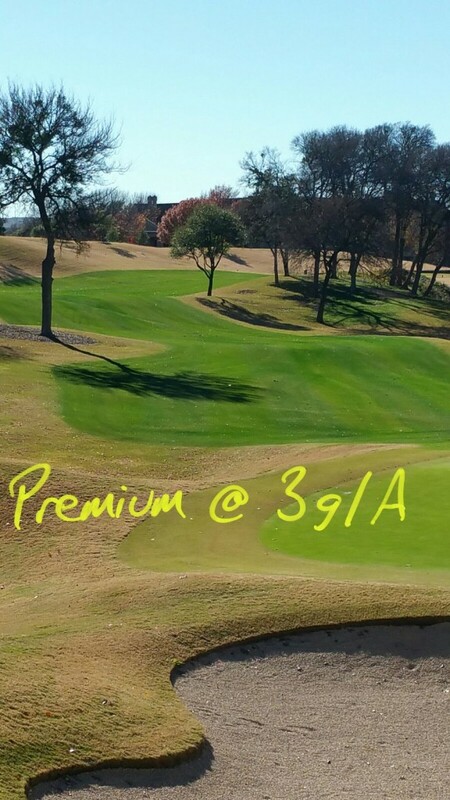 Endurant Premium applied on dormant winter turf at the rate of 3 gallons per acre at Stonebriar Country Club in Dallas, TX. 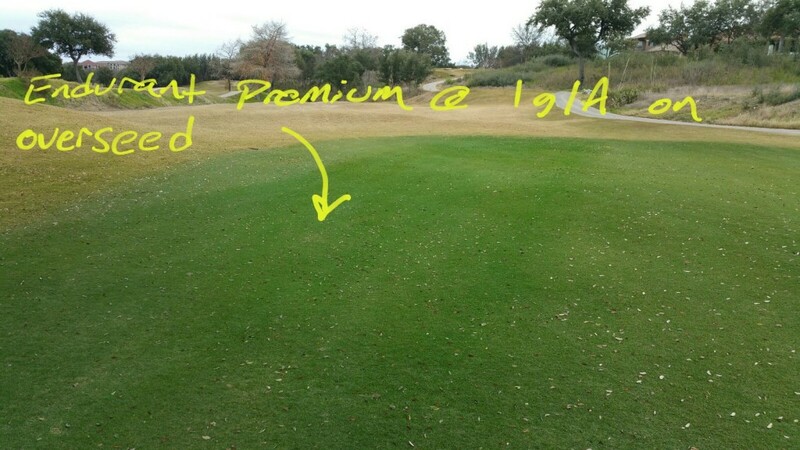 Endurant Premium provides vibrant green of popular Bermuda grass species to brown dormant turfgrass. 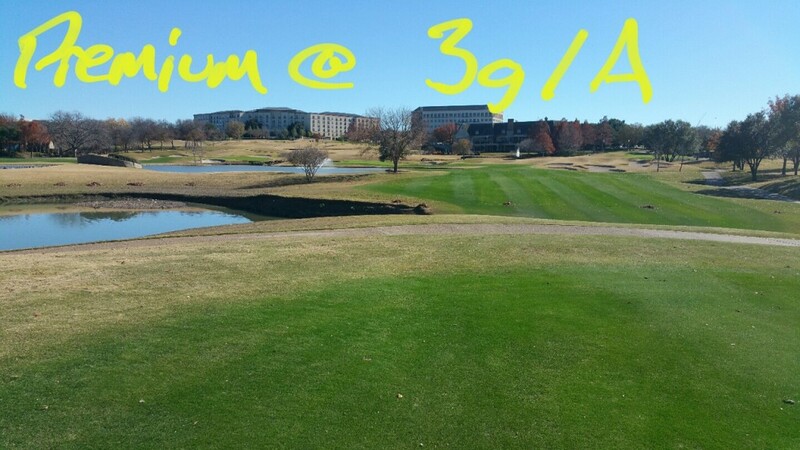 Endurant Premium was applied at the rate of 3 gallons per acre at Stonebriar Country Club in Dallas, TX. 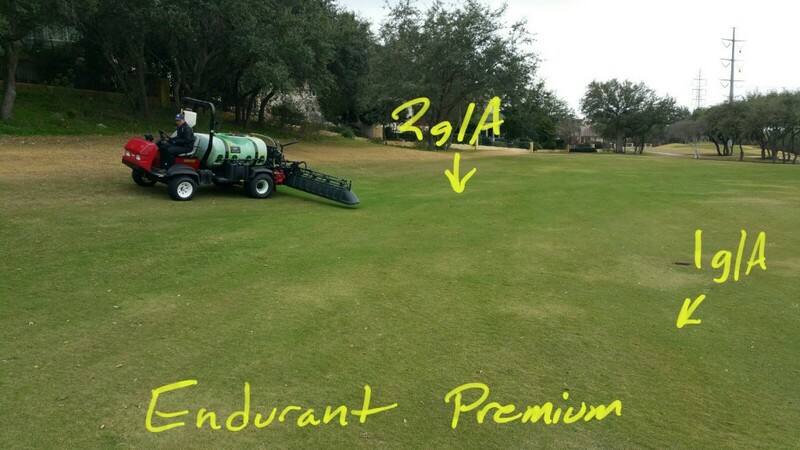 Golf Course superintendents choose Endurant instead of overseeding, over-watering and over-fertilizing. 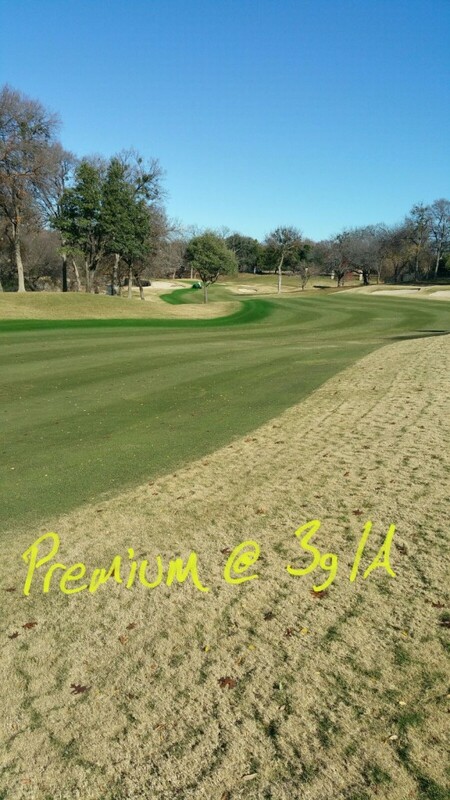 Endurant Premium applied at the rate of 3 gallons per acre at Stonebriar Country Club in Dallas, TX looks just like overseed. 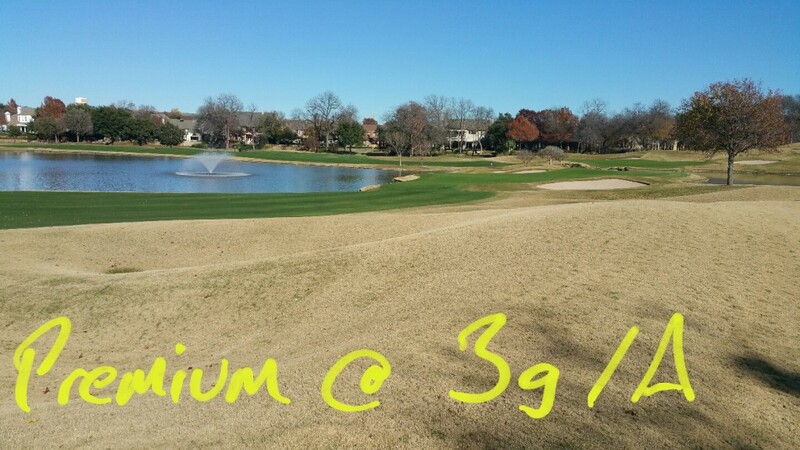 Compare 2 gallons per acre of Endurant Premium with 1 gallon per acre of Endurant Premium on brown dormant turf grass. The browner the turf grass, the higher the suggested application rate. Many times golf course superintendents will supplement the color provided by overseeded with Endurant. 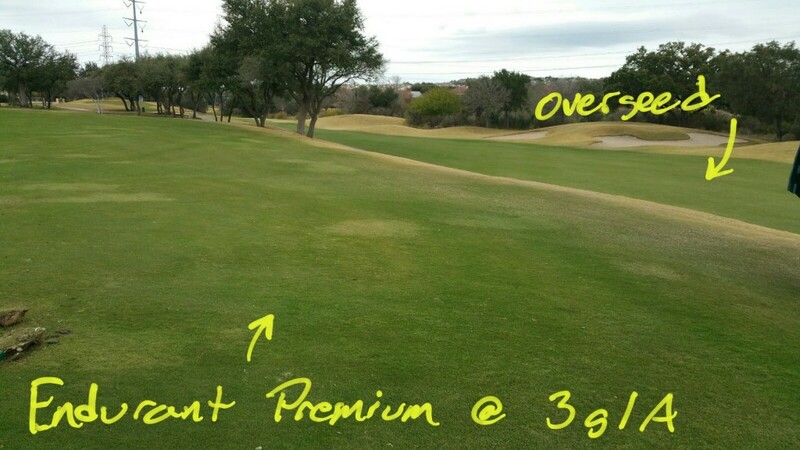 Here Endurant Premium is applied at the rate of 1 gallon per acre on overseeded turfgrass during winter dormancy on this Texas golf course. 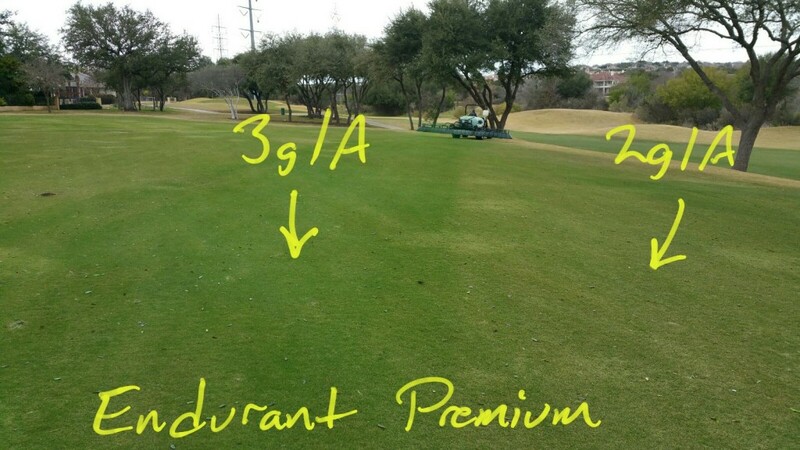 Compare 3 gallons per acre of Endurant Premium with 2 gallons per acre of Endurant Premium applied to straw brown dormant grass in Texas this winter. 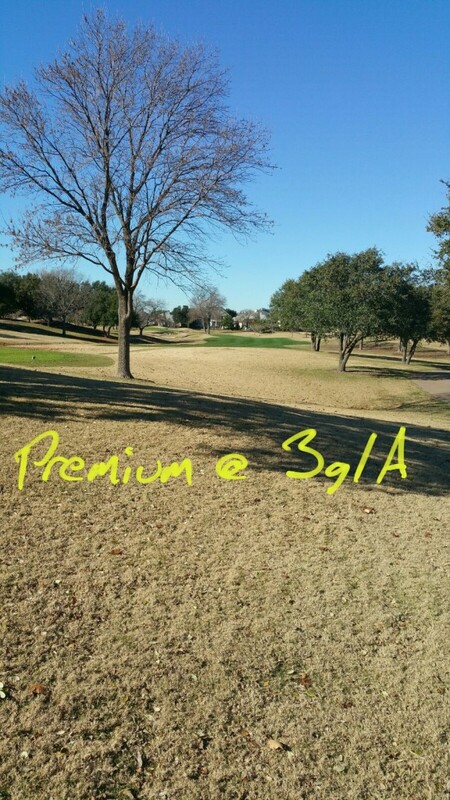 Endurant Premium provides rich, lush green at the rate of 3 gallons per acre applied to this completely brown turf in Texas. 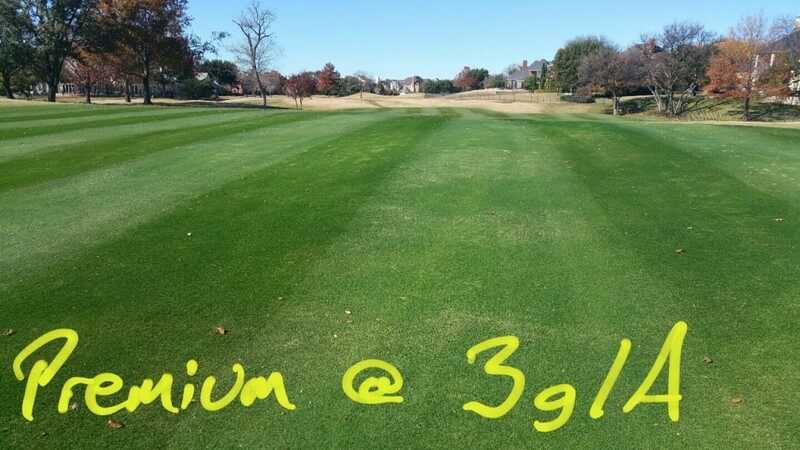 Compare 3 gallons per acre with 2 gallons per acre on dormant Texas turf. Endurant Premium is highly concentrated organic pigments mixed with binders for long lasting coverage up to 3 months or sometimes longer. 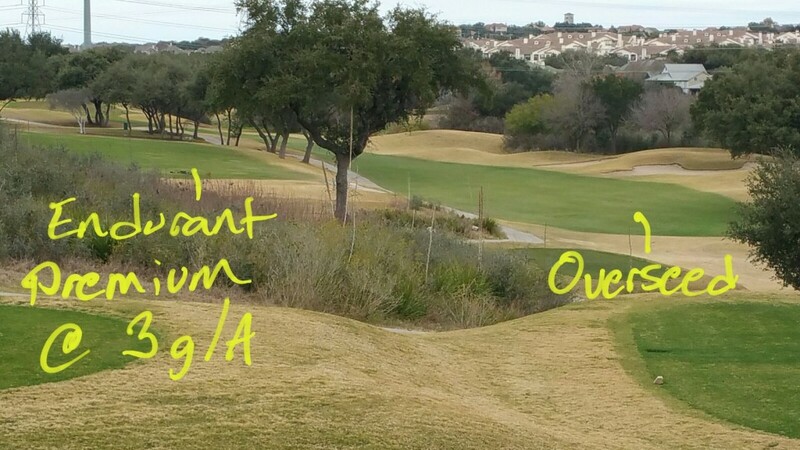 Golf Course Superintendents and other turf professionals call Endurant “liquid overseed.” Compare Endurant Premium in the forefront with Endurant overseed in the distance. Both provide lush green. 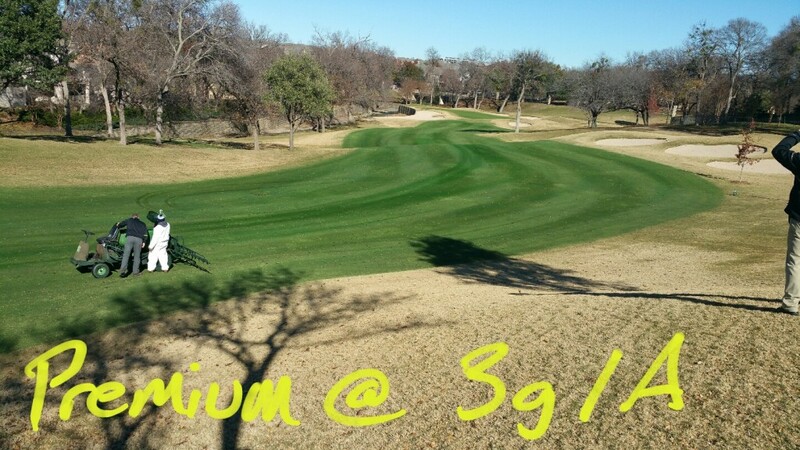 Endurant Premium and other Endurant turf colorants provide a savings in seed, water, fertilizer and other harsh chemical usage while assisting in earlier spring time greenup. 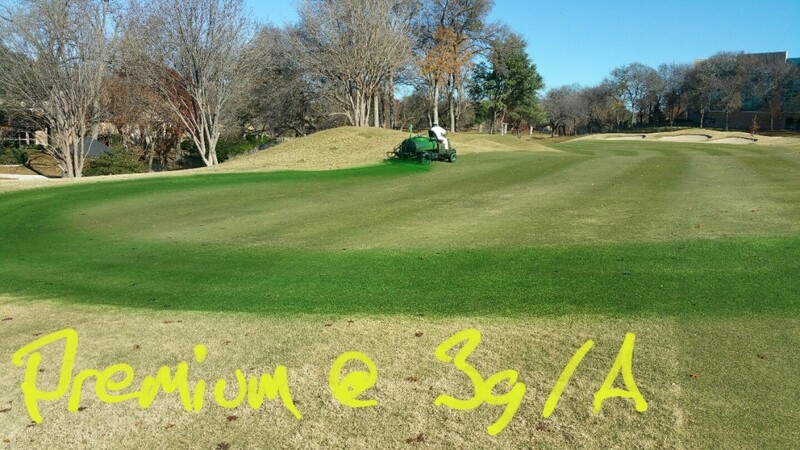 Almost done applying Endurant Premium at the rate of 3 gallons per acre on dormant turf grass in Texas. Looking great! 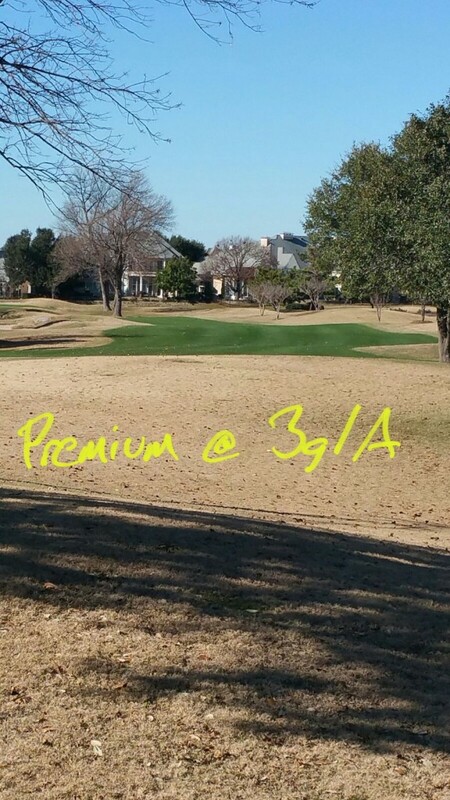 Endurant Premium going down at the rate of 3 gallons per acre on dormant brown grass in Texas this winter.